I was certain I had posted this shot but cannot find it in the archives. Mary MacADNski: She made a new friend today. Sniffed a trapper for a long extended period. quelle beauté ! Elle est drôle avec l'anse du panier entre les yeux. Mary MacADNski: She is goofy and funny. I love these photos! I think I would be thoroughly entertained by Purrl! Mary MacADNski: She makes friends easily. As I was telling Ray, "She made a new friend today. Sniffed a trapper for a long extended period." Cats just love getting into things! Mary MacADNski: She loves baskets and boxes. Nothing silly in attracting the necessary adoration - and food might follow! Mary MacADNski: She loves her boxes and baskets. 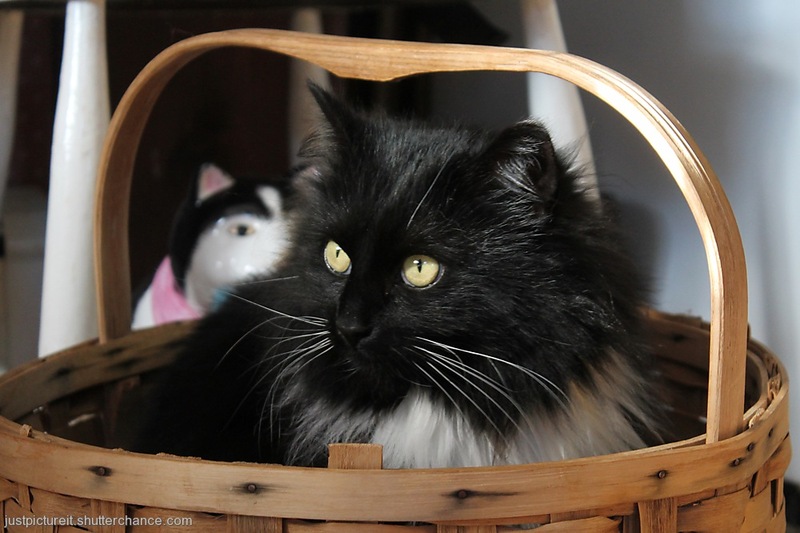 Mary MacADNski: She loves her boxes and baskets, and my bed, this past cooler week. Silly, but maintaining her dignity. Mary MacADNski: She earns that back, with kisses. Looks like she's having a good time. I like the main shot especially with the handle across here face. Mary MacADNski: She is such a goof.